The Man has been in Sydney on business for three days which means a couple of nights on my own (which I don't mind now and again). First night I cooked myself chicken kiev, second night went to my daughters for roast chicken. The man was home tonight so this morning as I was running out the door to work I pulled out the freezer what I thought was a piece of steak big enough for two. This turned out to be a fillet of lamb (backstrap). I hesitated at what to cook with this. 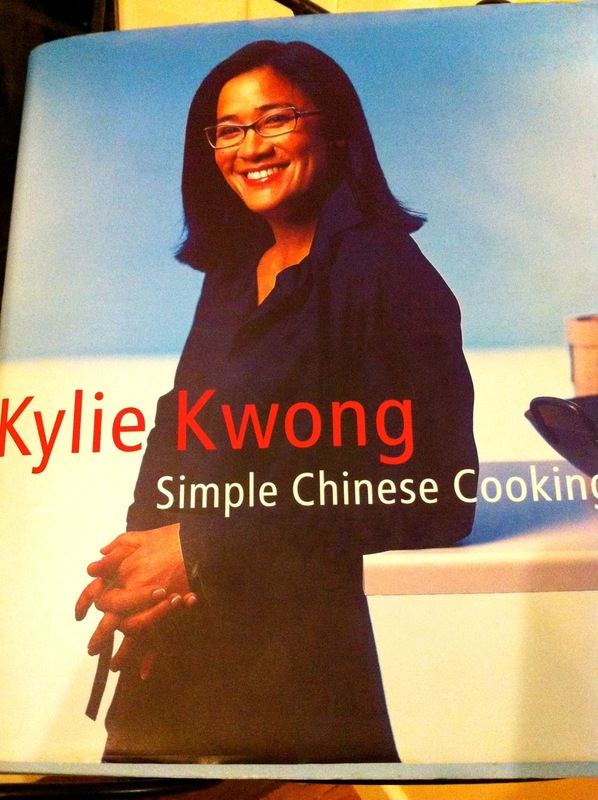 As a home coming treat I thought I would make the man's favourite food (anything chinese) and flicked through my Simple Chinese Cooking by Kylie Kwong. This is such a great book and we cook something from it at least once a week. Unfortunately chinese cooking doesn't include many lamb dishes so the flicking back and forth through "Kylie's" book went on for some time before I could decide what I could adapt to my lamb. Eventually I settled on Stir-Fried Beef/Lamb with Oyster Sauce plus I had some vegetables in the fridge I could use to pad out the dish as the lamb fillet didn't look quite enough. I shouldn't have worried - there was enough for four! Kylie's ingredients always make a long list but the preparation is what takes the time and the cooking is really quick - so be prepared! Here is my adaption of Kylie's recipe. You could actually leave out the meat and just have vegetables. Vegetables - I used a couple of big field mushrooms, capsicum and cauliflower florets (or anything you think suitable from the fridge). Slice meat finely and marinate in half the wine/sherry and salt and put in fridge for 30mins. Prepare onion, ginger and garlic. Cut any other vegetables into bite sizes pieces. Add half the marinated meat and stir-fry for 30 seconds. 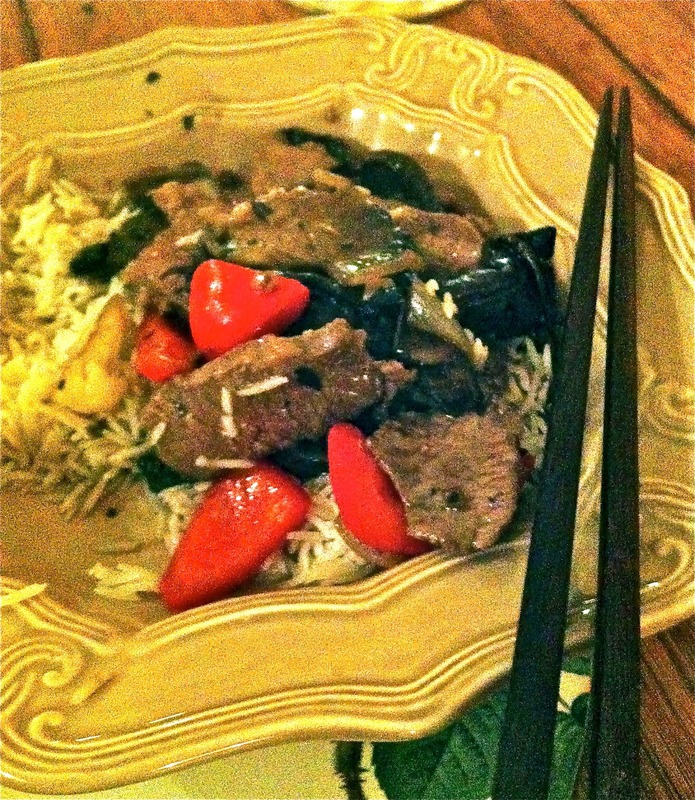 Remove meat from the wok with a slotted spoon, set aside and repeat with remaining meat. Add remaining oil to the wok and throw in onions, ginger and garlic and stir-fry for a minute or so - keep stirring to avoid the garlic burning. Add all the vegetables and keep stirring for several minutes (firmer veg will take a little longer). Return meat to wok with the remaining wine, oyster sauce, sugar, soy sauce, vinegar, seasame oil and water and stir-fry for a further minute or until lamb/beef is just tender. Serve on a bed of rice and eat straight away while piping hot! We enthusiastically tucked into this and nearly forgot to show you. Sorry about that. It was gone all too quickly. 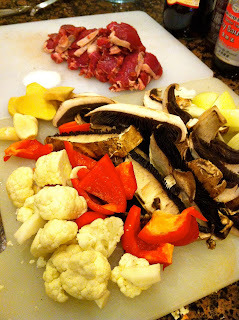 Labels: capsicum, cauliflower, chinese, garlic, ginger, lamb fillet, mushrooms, onion, vegetarian. Sounds good and looks good - just wish everyone liked Chinese food, but one likes anything and everything, one likes only vegetable or meat dishes, one only likes certain dishes and finally we have one who will only eat crispy duck! It's just easier not to bother! Well, not too often anyway. 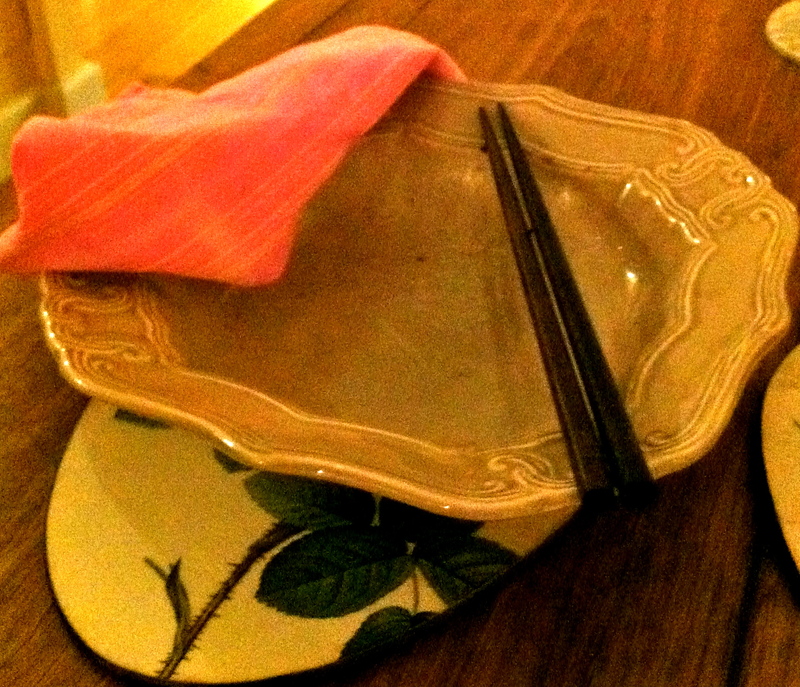 What a shame - this dish is perfect for the bland eater. It is neither fishy nor spicy, just very tasty (although the ginger does have a little kick - which I love, but you could leave this out) my grandchildren think this is yummy and love to watch this go from chopping board (where they have helped with the ingredients) to wok to plate. Hope you give it a go. This lamb fillet was just perfect to stir fry - it cooked so quickly and was still very tender. thanks for your comment. I love it when you say you have cooked a "Kylie Kwong" I just know it is going to be great. My book has some pages that are used over and over again, I am sure you have your favourites too. I have to admit that this book was actually purchased by my husband as he is addicted to Chinese food and is secretly in love with Kylie! I have found the obstacle to cooking Chinese is not having all the ingredients. At the front of "Kylies" book is a list of the ingredients used in all her recipes. We went and stocked the cupboard with everything we needed. This makes cooking easy. looks so easy to prepare and delicious...mouthwatering! Kalyan thanks for commenting - it was very yummy! Mary - the flavours are perfectly balanced - sometimes I use a little less salt but apart from that Kylie has it just right. Thanks for popping by. Wow, this looks super delicious! I really like eating vegetables and this dish is making me hungry now! I will now copy the steps and save the ingredients of this recipe and cook it later. Thanks for sharing this to us! Marvin so glad you liked this - I hope you enjoy it.